Facebook Pages — the social network’s profiles meant for businesses, celebrities, and public entities — are becoming an increasingly important way to establish a long-term relationship with customers and fans. Many businesses are sprucing up their Pages with applications, and everyone is always on the hunt to get more Likes and Comments on their Updates (posts with higher user engagement will show up in more News Feeds). Facebook’s built-in Insights tool does a decent job helping you keep tabs on your Page’s performance, but there’s some data that may be even more important: how your arch-rival is doing. 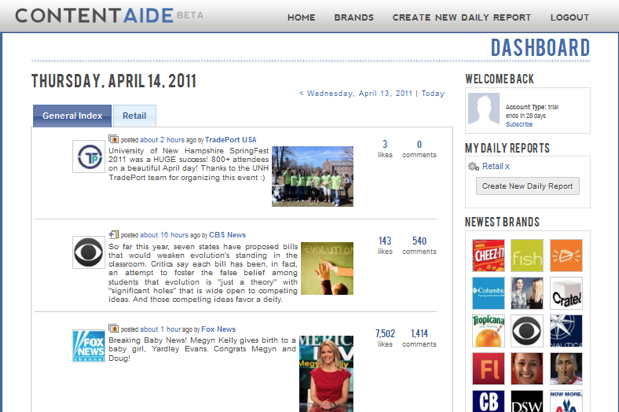 Which is where ContentAide, a new startup from VentureBeat writer Cody Barbierri, comes in handy. The service is pretty straightforward: tell it what Facebook Pages you’d like to keep an eye on, and the site will automatically generate a daily report on how that Page is performing. This isn’t just a Page’s overall ‘Like’ count either — ContentAide will also send you each individual status update and photo posted, along with how many Likes and Comments they received. You can receive reports for your own Pages and for competitors’ Pages as well. Barbierri says that ContentAide uses an algorithm to figure out the relative success of each status update — if your page has hundreds of thousands of fans, then obviously it’s much easier to get 50 ‘Likes’ on a post than if you only had 1,000 fans, and the reports take this into account. Down the line, Barbierri hopes to add some deeper analysis, like automatic reports on what types of updates have been most effective. ContentAide is charging $20 per month for one daily report and goes up from there — Barbierri says that in addition to individuals and small businesses, the service is looking to cater to consultants and firms that may want to receive multiple reports every day.